Click a question to view the answer. If you still can’t find what you’re looking for, then feel free to contact us. Where’s the nearest Loc-Box site to me? We have Self Storage sites in Corby, Kettering, Market Harborough, Daventry, Newark and two in Northampton (one at Creaton and one at Moulton Park). Have a look on our search page to see which is most convenient. Am I committed long term? No, on our pay as you store packages you are only charged for the days you use your Loc-Box. This is however subject to a 14 day minimum charge. How does your Pay as You Store package work? On our pay as you store package we have a minimum stay of just 14 days after which you just pay for the days you have the Loc-Box for. We don't take a deposit but we always bill in advance. You will pay your first two weeks payment on booking and then by direct debit going forward. Having paid your first two weeks we will collect the remainder of your first month by direct debit. Going forward we collect monthly in advance on the first working day of each calendar month. 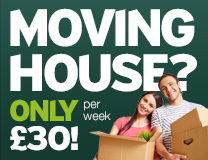 If you move out part way through a month we will refund any days you have paid for and not used. You are sent a full breakdown of this on your booking in email. How does a six or 12 month package work? Customers who commit to and pay upfront for six or 12 months upfront receive a discount. At the end of this period they can either renew for a further 6 or 12 months, move to a pay as you store package or move out and end their agreement. What sizes are your Loc-Boxes? All of our Loc-Boxes measure 150sqft (13.75 sqm). This fits the contents of an average 3 bedroom home. 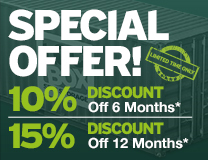 In total each Loc-Box is 1160 cu ft.
Why choose Loc-Box Self Storage? Our rates – We believe our rates are amongst the most competitive in the region and certainly offer much better value than conventional self storage facilities. Our Opening Hours – All our sites are open 365 days a year, many are open 24 hours a day. How do I book a Loc-Box? How much notice do I need to give to have a Loc-Box? As long as we have a Loc-Box available you can move in straight away. 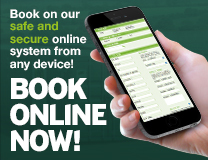 Just book online or give us a call. As we sometimes run completely full we recommend that you give us a few days notice so as not to be disappointed. Your Loc-Box will come with its own high grade padlock. There is addition space on the door for an extra padlock if you wish. What can I store in a Loc-Box? Our Loc-Boxes are great for storing household furniture, surplus stock, document archives or virtually anything else which you need space for. Anything liable to leak oil or other items which will stain or damage the unit. When can I access my Loc-Box? At all our sites we offer access 365 days a year. At most our sites we offer access 24 hours a day however at some sites we close overnight. Will my Loc-Box be safe and secure? We understand how important your belongings are to you and take security seriously. Our sites are security fenced with monitored CCTV and recorded gate opening systems. Each Loc-Box itself is made out of corteen steel and come with a high grade padlock protected by a steel shroud. If you wish to put an additional padlock on the Loc-Box you can do. Because our security is so good we are able to offer such good rates of insurance. We like to ensure that everything in our Loc-Boxes is properly insured. This helps give you peace of mind as well as us. Most home insurance policies only cover goods in your home. We are able to insure your contents through our broker. Will my Loc-Box suffer from damp? Our Loc-Boxes are very similar to the shipping containers which sit on the open deck of ships. In fact most things we store would already have spent the first few months of their lives in one being transported into the country. The Loc-Boxes themselves are completely waterproof (our insurance covers this). We’ve had customers storing furniture etc with us for over ten years without any problems. What we do recommend is that customers try to avoid bringing moisture into the Loc-Box. Whilst we have installed small vents any water brought in will evaporate and take some time to escape from the Loc-Box. With that in mind please ensure freezers are defrosted and washing machines etc are fully drained down. I already have one Loc-Box can I have another? Of course we always try to help our customers. Just give us a call and we will let you have the nearest available Loc-Box to your current one. How can I pay for my Loc-Box? For our pay as you store customers we ask everyone to pay by direct debit. This is the most cost effective way for us and enables us to offer such great rates. For customer who pay six months or more in advance we can take payment by card over the phone or by BACS. Unfortunately we are not able to take cash. We don't take a deposit but we always charge in advance.